You are here: Home / News / Dawn Staley has become coaching trailblazer for black women. Dawn Staley has become coaching trailblazer for black women. (ThyBlackMan.com) The state of South Carolina was in basketball heaven earlier this month as the University of South Carolina’s basketball team by both men and women were among the final four teams left in their respective NCAA Basketball Tournaments. However, it was only the South Carolina women’s basketball team that was able to achieve the ultimate in success in winning the entire Women’s NCAA Basketball Tournament and bring a national title to Columbia, South Carolina. 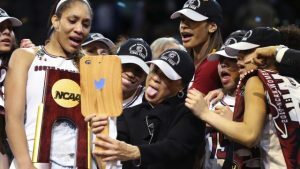 While that team was led on the floor by the talents of star forward A’ja Wilson, the heart and soul of the team comes from its accomplished head coach Dawn Staley. By adding a national championship to her resume, Dawn Staley has become a strong example of how the leadership of black women can excel in the coaching ranks. In 2013, Dawn Staley was enshrined in Naismith Memorial Basketball Hall of Fame. Her great playing career included being a two-time National Player of the Year in college at the University of Virginia. She was also an important figure and a playmaker for the talented U.S. women’s basketball teams of the 1990s and early 2000s, who earned three Olympic gold medals. Staley was also among the faces of the inauguration of the WNBA as one of the most recognizable women’s basketball players in the world at the time. She lived up to the hype as a five-time WNBA All-Star. However, Staley’s coaching resume is becoming impressive itself. Dawn Staley has been able to translate the competitiveness and toughness she was known for as a point guard into becoming a very successful head coach. The transition into becoming a head coach for the first time in 2000 was made easier by the fact that she coached at Temple University, which is located in Philadelphia, Staley’s hometown. Being able to recruit the Philadelphia area she was familiar with paid off for Staley as she led Temple to six NCAA Tournament appearances. Despite leaving Temple and her hometown of Philadelphia for South Carolina, Staley has not forgotten her roots and has made her city proud of her accomplishments. The leadership that Dawn Staley has exhibited in both her playing career and coaching career can also serve as a catalyst for black female athletes who have seen Staley transition from the playing court to the head coaching position. She was also recently named as U.S. women’s Olympic basketball head coach for the 2020 Tokyo Olympics, which is a very prodigious honor. She will take over the head coaching duties from legendary UConn head coach Geno Auriemma, whose UConn teams have also been the most recent women’s NCAA basketball champions. It is also important to note that South Carolina winning the women’s NCAA Tournament made Staley the first black woman to be the head coach of that championship since 1999, when Carolyn Peck led Purdue to the title. Dawn Staley continues to be a trailblazer for black women in various ways.